You would think that the backyard would be the most logical place to start when you want to plant a garden, right? In our case, no. This is our 4th garden season, and we have just now officially moved into the back. Since it's only the beginning of June, not a lot has filled out yet in our gardens. We have nearly everything planted, however, and some things are already taking off. Come along on my little tour Today in The Garden! Here is the original, 4-year-old garden space, along the south side of the house. Our property ends with that sidewalk. First two beds contain my Amish paste tomatoes (click here to see how I often plant my tomatoes sideways), kale, sprouting marigolds, and a leftover radish I'm letting go to seed. The herb garden contains spearmint, chocolate mint, chives, parsley, thyme, sage, oregano, dill, and some lambsquarters. My rosemary didn't make it through the winter. On the other side of the compost ball: the Earth Buckets contain a Roma Italia tomato and a Yellow Pear tomato. Last beds along the side of the house have the hot peppers (Carolina Reaper, Mama Mia, Habanero, Anaheim, Ghost, and a mild Banana). There are also green onions, garlic, mache (corn salad), and some spinach that I'm letting go to seed. We've got scapes! These are the flowers of the garlic plant. We need to harvest them so the garlic will put its energy into the bulbs below the soil. Our first time growing mache (corn salad). It's pretty, and tasty! Turning the corner of the sidewalk, there are a few pots filled with sprouting cilantro, and some petunias. Turning and heading to the back of the house; a little gateway into a shady mix-match garden. Back here in the pots we have stevia, sorrel, morning glories, a pot full of yellow wood-sorrel that came up on its own and is the home of our first fairy house. (you can see the little brown roof). Behind everything else you can see our leaf mold pile from last fall, in the corner of the fence. I've used the leaf mold like crazy--I'll have a leaf mold pile every year from now on. Our first fairy house! This space is going to become quite the fairy garden; we've already been working on things to put in there. We are excited to share it later! In the pallet bed; sugar snap peas, kohlrabi, kale, cabbage, tatsoi. As you can see, I've got some thinning to do in this little patch! Facing the back from the patio. Our new firepit and the three beds made of cedar pickets. I love this view in the morning! In the beds: pumpkins, yellow squash, tigger melon, birdhouse gourd, cucumbers, nasturtium, marigold, sweet potatoes, green peppers, jalapenos, tomatillos, dragon tongue runner beans, red Chinese runner beans, 4 kinds of bush beans, carrots. I planted a row of petunias along each side of the bean bed after I read it's a good companion. We'll see! The other two boxes I built out of cedar pickets, on the other side of the yard. They contain 4 heirloom tomatoes; Green Zebra, Black Icicle, Tigerella, and Topaz. To the left of the bed: some yarrow, sedum, and lillies. To the right of the tomatoes, a long row of sunflowers that have not sprouted yet. On the north side of the house, there is a 4-foot wide strip of property that has so far contained nothing, since it's mostly shade all day long. I decided to start some comfrey back there to see if it takes off. I'd love for this comfrey to take off so I can use it for mulch and tea to feed the garden. 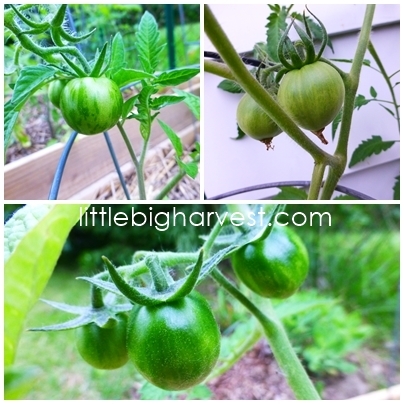 There are tomatoes starting on almost every tomato plant! Can't wait to eat some! Wow! You have a lot going on in your yard while still having a lot of room for the kids to play. Looks great! I finally grew garlic this year and the scapes were fantastic! We chopped them up and used them in hamburger and stir fried greens, but I think next year I will prepare them like asparagus. I wish I had more of them!